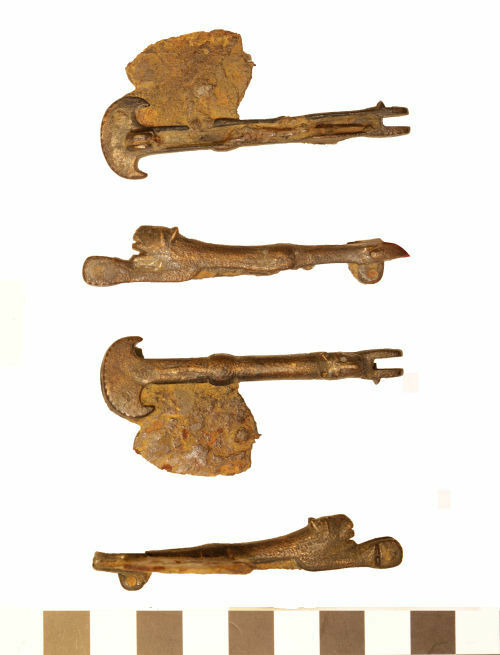 A cast copper-alloy Roman multifunctional eating utensil, dating to the second or third century AD. The handle is in the form of an elongated, crouching feline, probably a lion or panther, with front legs outstretched. The legs are set forward of and below the animal's head which has moulded ears, slight recesses for eyes and a groove showing the mouth. The elongated body behind is U-shaped in cross-section, the underside being recessed. Just over halfway along the animal is a slight bulge representing the creature's hind quarters and legs. The handles continues, terminating in a crescentic curve. One half of this piece sliced and pierced. A groove runs along the side of the handle from the crescentic terminal to just past the bulge. The upper surface of the feline's body is decorated with a line of stamped, knurled decoration and there are small notches on the outer edge of the crescentic terminal as well as a slight cross-shaped groove. The form of the handle is known from published examples, and can be classified as Sherlock's (1976, 250) Type B. Other examples have been recorded on this database (see 'Notes' below). It is known the spoon bowls were held within the paws and would have folded up above the cat's head. The general dating given to these folding spoons is 2nd or 3rd century given the form of spoon bowls and the contexts in which they have been excavated. The utensil measures 66mm in length and has a maximum width of 18mm. These objects have been examined by David Sherlock. They are rare and often misidentified simply as folding knifes in the absence of a bowl (e.g. Mills 2000, 86; ref. RB258). In 1976 Sherlock had gathered details of four handles, alongside three separate bowls with their distinctive L-shaped attachment ends. Very few were found with their bowls attached (e.g. BM Registration number: 1856, 0701.1152); all but one of these were 'mandolin' shaped. By 2007 Sherlock's cumulative totals had reached eight handles and six separate bowls. Excitingly, along with this example, a further six handles have been recorded on this database: SF2196, GLO-C01E93 (= UKDFD 9052), DENO-AEBF93, LIN-A68C52, KENT-DD9F73, NCL-635E92. To these we might add HAMP-349434 (a possible bowl) and NLM4722 (a seemingly related piece). If one of Sherlock's (2007, 364; ref. B12) examples is treated as a related piece (Crummy 1983, 69; ref. 2020 - in the form of a dolphin), and the bowls treated with caution, then the six definite PAS examples nearly double the known corpus. Most examples are of a comparable form, although another as yet unpublished is more ornately decorated. Another is of the same style but far more involved, with extra lugs for a total of six implements (Meadows 2003, 36; ref. 12; Sherlock 2007, 364-365; ref. B14). The distribution pattern of the corpus so far recorded does not suggest any clear pattern and seems to rule out a direct association with the army as with the latter day successor of these objects, the Swiss Army knife.